To locate screens, windows, and views, draw in them, and report where the cursor is positioned, it's necessary to have some conventional way of talking about the display surface. The same conventions are used whether the display device is a monitor that shows images on a screen or a printer that puts them on a page. All quantities and distances are measured by floating-point values of the type float. A single coordinate unit is 1/72 of an inch, roughly equal to a typographical point. However, all screens are considered to have a resolution of 72 pixels per inch (regardless of the actual dimension), so coordinate units actually count screen pixels. In other words, one unit is the distance between the centers of adjacent pixels on-screen. A window coordinate system has its origin at the left top corner of the content area of a window. It's used principally for positioning views within the window. Each window has its own coordinate system so that locations within the window can be specified without regard to where the window happens to be on-screen. A view coordinate system has its default origin at the left top corner of the view rectangle. However, scrolling can shift view coordinates and move the origin. View-specific coordinates are used for all drawing operations and to report the cursor location in most system messages. A BPoint object is the simplest way to specify a coordinate location. Each object stores two values—an x-coordinate and a y-coordinate—that together locate a specific point, (x, y), within a given coordinate system. The sides of the rectangle are therefore parallel to the coordinate axes. The left and right sides delimit the range of x-coordinate values within the rectangle, and the top and bottom sides delimit the range of y-coordinate values. For example, if a rectangle's left top corner is at (0.8, 2.7) and its right bottom corner is at (11.3, 49.5), all points having x-coordinates ranging from 0.8 through 11.3 and ycoordinates from 2.7 through 49.5 lie inside the rectangle. If the top of a rectangle is the same as its bottom, or its left the same as its right, the rectangle defines a straight line. If the top and bottom are the same and also the left and right, it collapses to a single point. Such rectangles are still valid—they specify real locations within a coordinate system. 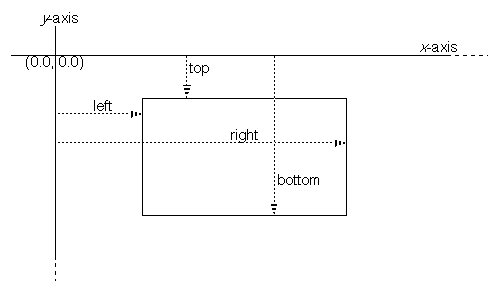 However, if the top is greater than the bottom or the left greater than the right, the rectangle is invalid; it has no meaning. A BPolygon object represents a polygon, a closed figure with an arbitrary number of sides. The polygon is defined as an ordered set of points. It encloses the area that would be outlined by connecting the points in order, then connecting the first and last points to close the figure. Each point is therefore a potential vertex of the polygon. 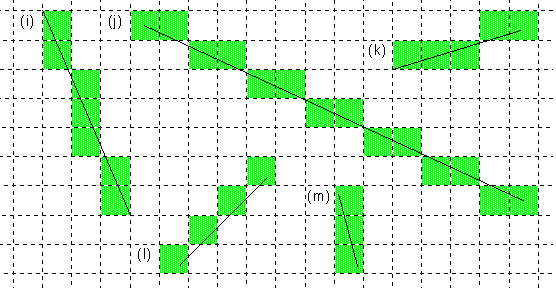 A BRegion object defines a set of points. A region can be any shape and even include discontinuous areas. It's equivalent to a set of rectangles. The device-independent coordinate space described above must be mapped to the pixel grid of a particular display device—the screen, a printer, or some other piece of hardware that's capable of rendering an image. For example, to display a rectangle, it's necessary to find the pixel columns that correspond to its right and left sides and the pixel rows that correspond to its top and bottom. This depends entirely on the resolution of the device. In essence, each device-independent coordinate value must be translated internally to a device-dependent value—an integer index to a particular column or row of pixels. In the coordinate space of the device, one unit equals one pixel. This translation is easy for the screen, since, as mentioned above, there's a one-to-one correspondence between coordinate units and pixels. It reduces to rounding floating-point coordinates to integers. For other devices, however, the translation means first scaling the coordinate value to a device-specific value, then rounding. For example, the point (12.3, 40.8) would translate to (12, 41) on the screen, but to (51, 170) on a 300 dpi printer. 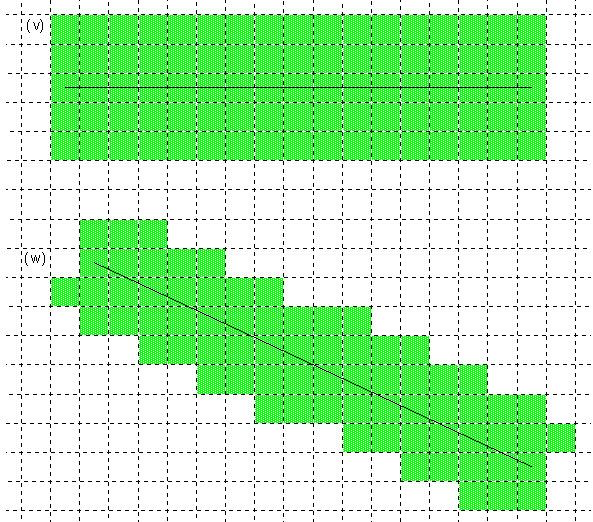 The axes are located in the same place for all devices: The x-axis runs left to right along the middle of a row of pixels, and the y-axis runs down the middle of a pixel column. They meet at the very center of a pixel. 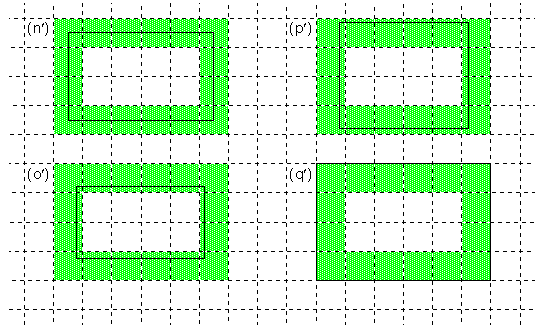 As this illustration shows, it's possible to have coordinate values that lie on the boundary between two pixels. The next section describes how these values are mapped to one pixel or the other. Pixels are chosen after the pen size and all coordinate values have been translated to device-specific units. Device-specific values measure distances by counting pixels; 1 unit equals 1 pixel on the device. dpi is the resolution of the device in dots (pixels) per inch, 72 is the number of coordinate units in an inch, and device_value is rounded to the closest integer. To describe where lines and shapes fall on the pixel grid, this section mostly talks about pixel units rather than coordinate units. The accompanying illustrations magnify the grid so that pixel boundaries are clear. As a consequence, they can show only very short lines and small shapes. By blowing up the image, they exaggerate the phenomena they illustrate. The thinnest possible line is drawn when the pen size translates to 1 pixel on the device. Setting the size to 0.0 coordinate units guarantees a 1-pixel pen on all devices. Only pixels that the line path actually passes through are colored to display the line. If a path begins or ends on a pixel boundary, as it does for examples (a) and (b) in the illustration, the pixels at the boundary aren't colored unless the path crosses into the pixel. The pen touches the fewest possible number of pixels. This normalization is nothing more than the natural consequence of the rounding that occurs when coordinate values are translated to device-specific pixel values. Although all the diagrams above show straight lines, the principles they illustrate apply equally to curved line paths. A curved path can be treated as if it were made up of a large number of short straight segments. The following illustration shows how some rectangles, represented by the solid black line, would be filled with a solid color. A rectangle includes every pixel that it encloses and every pixel that its sides pass through. 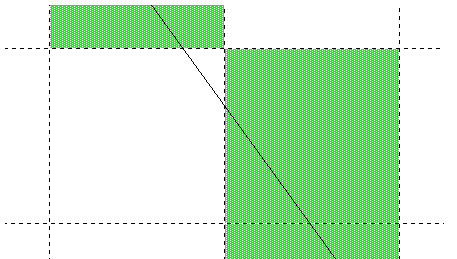 However, as rectangle (q) illustrates, it doesn't include pixels that its sides merely touch at the boundary. 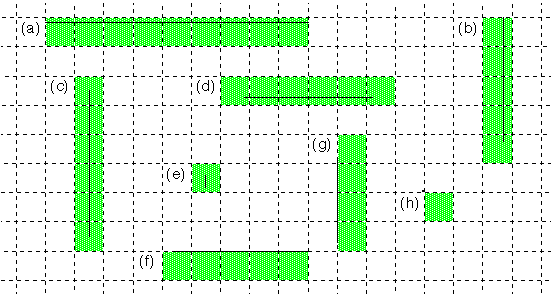 If the pixel grid in this illustration represents the screen, rectangle (q) would have left, top, right, and bottom coordinates with fractional values of .5. Rectangle (n), on the other hand, would have coordinates without any fractional parts. Nonfractional coordinates lie at the center of screen pixels. Rectangle (n), in fact, is the normalized version of all four of the illustrated rectangles. It shows how the sides of the four rectangles would be translated to pixel values. Note that for a rectangle like (q), with edges that fall on pixel boundaries, normalization means rounding the left and top sides upward and rounding the right and bottom sides downward. This follows from the principal that the fewest possible number of pixels should be colored. Each of the rectangles still covers a 6 * 4 pixel area. 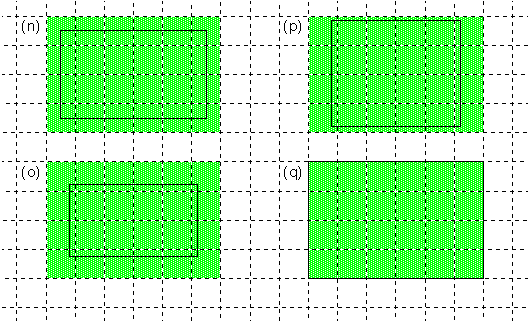 Note that even though the path of rectangle (q) lies entirely on pixel boundaries, pixels below it and to its right are not touched by the pen. The pen touches only pixels that lie within the rectangle. If a rectangle collapses to a straight line or to a single point, it no longer contains any area. 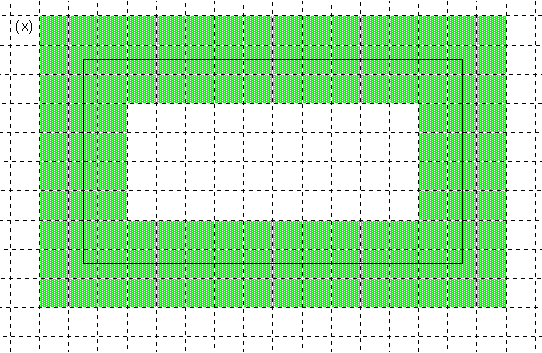 Stroking or filling such a rectangle is equivalent to stroking the line path with a one-pixel pen, as was discussed in the previous section. The same rules apply when stroking each segment of a polygon as would apply if that segment were an independent line. Therefore, the pen may not touch every pixel the segment passes through. When the polygon is filled, no additional pixels around its border are colored. 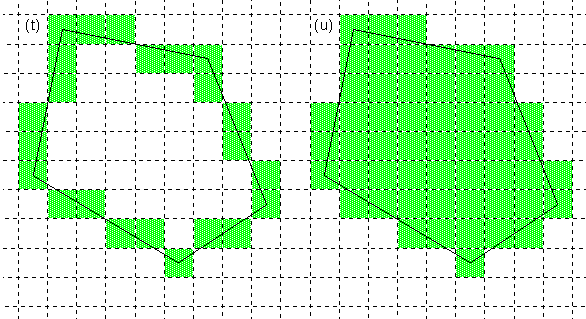 As is the case for a rectangle, the displayed shape of filled polygon is identical to the shape of the polygon when stroked with a one-pixel pen. The pen doesn't touch any pixels when stroking the polygon that aren't colored when the polygon is filled. Conversely, filling doesn't color any pixels at the border of the polygon that aren't touched by a one-pixel pen. The thickness or a vertical or horizontal line can be measured in an exact number of pixels. When the line is slanted, as it is for (t) above, the stroking algorithm tries to make the line visually approximate the thickness of a vertical or horizontal line. In this way, lines retain their shape even when rotated.